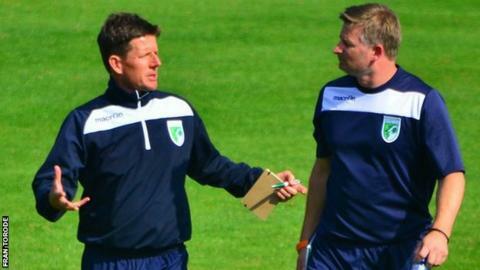 Guernsey FC coach Steve Sharman has warned that the club's players must show greater commitment. Manager Tony Vance and his backroom team warned the side about their attitude before last week's 3-0 win over Ramsgate - only their second victory since the middle of August. "The hard work continues and if they want to be part of this they need to buy into that," Sharman said. "There was a certain sense of people resting on their laurels a little bit." The Green Lions are currently sixth-from-bottom in Isthmian League Division One South, although they have up to four games in hand on many of their rivals. One of the coaching team's main concerns is the lack of players who are available to play in mid-week away games. Guernsey struggled to get a squad together for their last midweek away game at Molesey last month, which was postponed because of due to a waterlogged pitch. "When you look at who we had coming across, we had at one stage 11 players," Sharman told BBC Radio Guernsey. "There are good reasons why people can't be there, but also there are occasions where people will maybe take an easier route rather than the harder decision. "We know that to be successful in this league we need to get our best group out in midweek games away."